Mastiff dogs are powerful and active creatures. 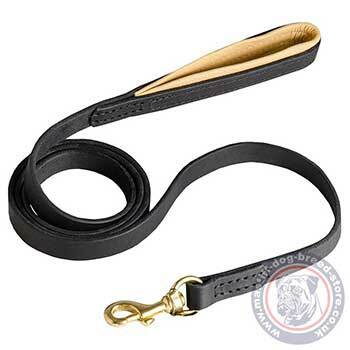 Make dog walking of your beast simple, pleasant and controlled with this strong leather dog leash. 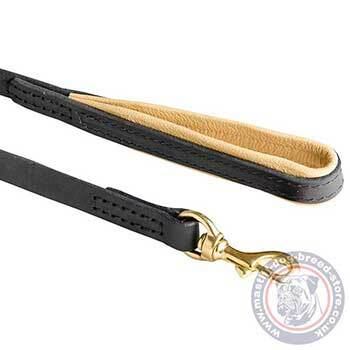 This running dog leash combines strength to handle a powerful mastiff dog and is pleasant to keep in a hand. The comfortable grip loop is padded with soft nappa lining and reliably stitched to protect you from rubbing and hurting if your dog will pull or make sharp moves. This leather dog leash is incredibly strong for walking, training, service and sport with medium and large dog breeds. Turn your attention to the solid brass snap hook for a collar or a harness adjusting. It is made with a swivel for preventing of entanglement.